Every foreigner performing work in Thailand is legally required to hold a work permit, a document issued by the government allowing the foreigner to work, collect a salary, and register for benefits. There are exceptions stated in the Working of Alien Act but they are few, for instance people working in an embassy. This permit is needed above and beyond a visa. No matter what your work is, even if you are working as a volunteer, you need a permit to work in Thailand. 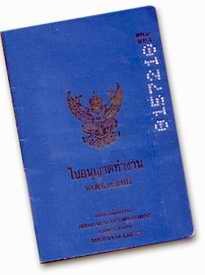 A work permit in Thailand a blue book like this one. To obtain a work permit in Thailand, you normally must first hold the correct visa. Tourist visas don’t cut the mustard – if you want a work permit, you’ll need a Non-Immigrant visa in your passport. This can be a Type B (business) for general employment, O (other) for volunteering or family matters (like if you are married to a Thai). In general, if you’re coming to Thailand to work, your employer will send you supporting documents to help you apply for this visa. This is important because it means that you already have an employer to act as guarantor for your work permit. Your employer must be a registered business (like a Thai company), organization (such as a charitable foundation), or institution (like a public school) in order to support your work permit application. Most employers will arrange you paperwork for you if they have ever employed foreigners before, however some may be hiring you as their first foreign employee and may not have experience in preparing the application. In fact they may not even realize that you must hold a work permit to work for them. Some may try to delay the application or try to convince you that you don’t need a permit to work there, but do not be put off. If you’re coming to Thailand specifically to work then your employer can apply for the work permit on your behalf before you enter Thailand. Processing can take from a few days up to a month or more, so doing this in advance can help you save time. However, your work permit is only officially issued when you present yourself to the labour office and sign for it. If you are the first foreign employee, or if you are starting your own company and will also work as an employee, then you may need assistance in preparing the application for your work permit. It’s important to note here that a company hiring foreigners must have a certain amount of registered capital per foreigner (normally 2 million Baht, half if the employee is married to a Thai, 3 million under the treaty of Amity for Americans, etc. ), and they normally must employ 4 Thais for every foreign employee. The paperwork required will vary depending on the type of organization you’ll be working for and the type of work that you’ll do. It may also take several tries to get the paperwork approved in case subtle details are incorrect or omitted. In most instances, it makes sense to hire a law office to prepare and submit your application for you unless the employer has experience applying for work permits. One more thing that you’ll need is a health check. You can go to any public hospital in Thailand to have your general health checked (heart, blood pressure, chronic diseases, etc.) and to receive a report which must accompany your work permit application. This generally takes less than an hour and not more than 200 Baht to accomplish. When your application is ready, you’ll need to take it to the Department of Employment (grom gan jat ha ngan)of the Ministry of Labour (gra-suang raeng ngan) for your province or region. Once submitted, in can take up to 6 weeks to process your application. When it’s ready, you’ll be invited to the office to pay for your permit, sign your name, and receive a small blue book (WP4) that must be kept with you or at your place of work during working hours. If your visa is only valid for few weeks, you may not be granted a long period, probably only until your visa runs out. Work permits used to be valid for a maximum of 1 year but since 2008, they can be granted for a maximum of 2 years. ** Please do verify because documents are constantly changing. This is just a guideline to help you. 5. Resume showing relevant experience and/or education. This must be translated into Thai. 6. Copy of degree and transcripts or professional certificates for jobs that require these (ex. TEFL or TESOL certificate for teaching English). They must be translated into Thai. 8. When applying for a company, they company will have to submit tax documents, VAT registration, registration documents, audit reports, list of foreigners working for the company, etc. The list is quite long. 1. Get Your Visa: To apply for a work permit, you need to have a visa first. Initially, your Non-Immigrant visa will be issued for only 90 days. 2. Get Your Work Permit: When you apply for your work permit, it will be issued only for the time that your visa is valid. So you will get your permit issued until the date that your visa is set to expire. 3. Extend Your Visa: Roughly one month before your visa’s expiry date, you can apply to extend your visa up to the end of a full year (so if you have 90 days first, they will grant you another 275 days to add up to 365). You need to hold a valid work permit in order to extend your visa, and a fee of 1,900 THB is required. 4. Extend Your Work Permit: Once your visa extension is obtained, you can return to the work permit office to extend your work permit for another 275 days, or to the end of your visa’s period of validity. This also requires an extra fee. Now you’re set for your first year. Every subsequent year, you can apply to extend your visa for the next full year. Once that extension is granted, you can extend your work permit for another year. Since 2010 however, work permits can be issued for 1 year (3000 THB) or 2 years (6000 THB). This is very convenient if you are planning to work for longer than 1 year in Thailand – you can limit your work permit extensions to once every 2 years, even though your visa will still need renewal each year. What’s In The Work Permit? Each work permit is given a unique identity number and remains the property of the provincial registrar with the Department of Labour. The document will contain your photograph, name, date of birth, nationality, address, and signature. Your work permit can be used as official proof of address in Thailand, which is useful for anything from buying a car to applying for a driver’s licence. The information required in your application will be added to the book, including your position, job description, office location, name of employer, and employment period. You’ll also notice a field that says ‘Locality permitted to work (Province)’, indicating the province where you’re legally allowed to perform work. If you want to work outside of this area, you must apply to make additions to the permit for the provinces where you may work. 1. The work permit must be held on the worker’s person or at the place of employment during working hours so that it may be inspected by officials at any time (fine not exceeding 1000 THB). 2. The permit holder must not engage in work outside the details specified in the work permit without prior permission from the registrar (prison term not exceeding 1 month and/or fine not exceeding 2000 THB). 3. 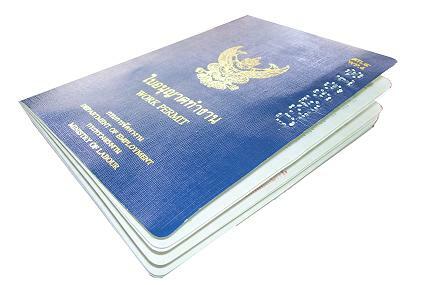 The permit must be renewed before its expiry date if the permit holder wishes to continue working (prison term not exceeding 3 months and /or fine not exceeding 5000 THB). 4. If the permit holder resigns from work prior to the expiry of the work permit, the permit must be surrendered to the registrar within 7 days of the resignation (fine not exceeding 1000 THB). What do you do with your work permit if you want to change jobs or employers? Changes to details in the work permit (position, job description, working locations, address, etc.) are quick and easy to do in person at the work permit office for a fee of 1000 THB per change. Changing employers is more involved, but still relatively simple process. If you have a year’s contract and wish to sign a contract with a new employer for the following year, then you can have your new employer prepare the necessary documents for guaranteeing your work permit (just like the initial supporting documents). This will include a new contract for your new job. You can take these to the registrar’s office and request to extend your work permit under the new employer for a fee of 3000THB. You can have more than 1 job description in a work permit. You can even have 2 different job descriptions in 2 different provinces of Thailand. Your work permit is your official proof of address and evidence of your status as a worker in Thailand. Any work performed without one is illegal and can carry grave consequences like fines and prison terms. For any work that you do in Thailand, make sure you have a permit that’s in-line with the law. DO NOTE THAT SOME MODIFICATIONS HAPPENED IN 2018. Since 28 March 2018, it seems that foreigners having a work permit are allowed to work for other companies and entities, unless the job is prohibited by Thai law.